Call it by any name, a khichdi is just about the greatest Indian comfort food ever invented. 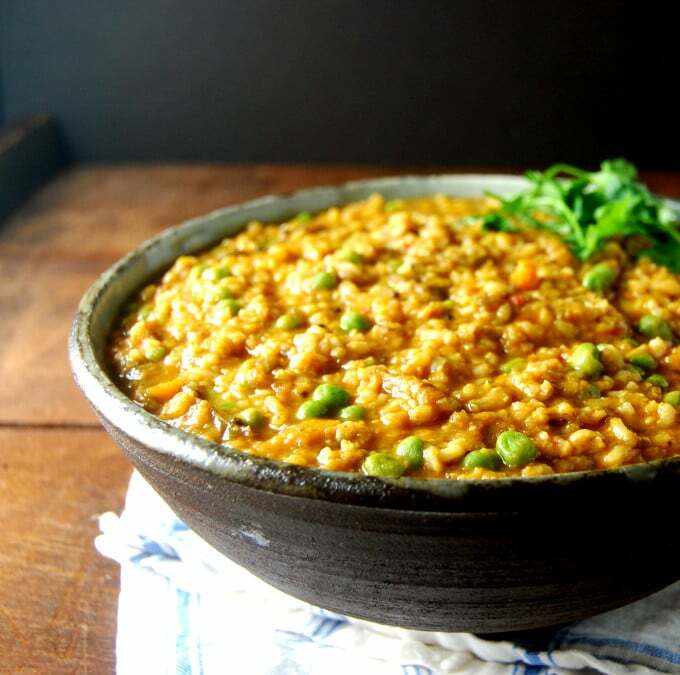 In this Masala Khichdi, I add a spicy, healthier spin with tons of veggies, making an already beloved dish even more worthy of your love. Vegan, gluten-free, soy-free, and nut-free recipe. 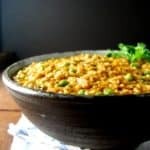 A popular one-pot meal that’s cooked in just about every Indian home is a khichdi or a khichari, and those are not the only names it goes by. It’s khichuri in Bengali, pongal in Tamil, khichri in Gujarat, and kedgeree in English (yeah, as in the language spoken by the Brits). Although the Brits, somewhere in transit, made an unnecessary addition — fish — to a recipe whose vegetarian deliciousness really needs no gilding. Today, we’ll take this recipe back to its roots but we’re going to do so with flair. A khichdi, at its most basic, is a pot of rice and lentils cooked together and it can be starkly plain (lentils, rice, salt, period). 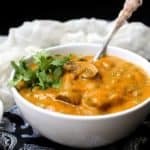 But the version I have for you today has, as the name suggests, a melange of flavorful spices and it’s enriched by the goodness of a ton of fresh vegetables. Even better, I make it with brown rice. One of the reasons I love Masala Khichdi is that it is a true one-pot meal, not one of those dishes that pretends to be one-pot and then asks you to, erm, please serve me with this side or that or I’m just not going to taste that good! When you make a Masala Khichdi, you can rest assured that all you need is a spoon and a bowl. And if you decide to make the wise decision of serving up some poppadums alongside, well, good for you! You can also add all kinds of veggies to the Masala Khichdi– really, use what you have on hand. I used sweet potatoes, eggplants and green peas because I had those around, but carrots and zucchini would be great here. Before I move on to the recipe, I just wanted to say a big thank you to all of you who have written in recently to say you’ve cooked the recipes, or just to say hello. Your emails and the messages you leave on the blog are much valued and I read — and am thrilled by — each one. You inspire me to keep going and learning what you like helps shape Holy Cow! If you have a pressure cooker, heat oil in the pressure cooker. Otherwise use a large saucepan. Add the cumin seeds and when they sputter, add the onions and curry leaves. Saute, stirring, until brown spots appear on the onions. Add the ginger and saute another minute. Add the tomato puree, turmeric, cayenne and coriander powder. Mix well and cook, stirring frequently, until the tomato puree darkens a couple of shades and bubbles at the corners. Add the vegetables. If you're using frozen peas, don't add them now. Add the rice and lentils. Mix everything well together, then add six cups of water or vegetable stock. If you're cooking in a pressure cooker, cover now and let the khichdi cook for 20 minutes after the cooker comes to pressure. On the stovetop, if not using a pressure cooker, bring the water to a boil, cover the pot with a tight-fitting lid and cook 45 minutes or until the rice and lentils are really soft. Add more water if needed at any time. You want the khichdi to have a slightly runny consistency, like a risotto. It shouldn't be too dry. Open the pressure cooker or pot. If you're using frozen peas, add them at this point and stir the khichdi well. Add the garam masala and salt and return the khichdi to heat to let it warm through. Garnish with the coriander or mint leaves. Khichdi is my ultimate comfort food. I can’t wait to try out your version – it reminds me of bisibele bath. Hi Ambica, you’re right– I kept thinking too how much it is like bisi bele bhath, one of my favorite recipes. 🙂 I should make it soon. Dear Shani, thanks for your lovely message and kind words. So glad you wrote. 🙂 And yes, this really is the ultimate comfort food, isn’t it? Best part is, it’s so simple. For the pressure cooker instructions, when do we add the rice? Do we add them with the vegetables? I’m hoping to try out this recipe soon. It looks fantastic! Hi Memoria, you add it right before adding the water. Thanks for pointing out– it’s in the recipe now. 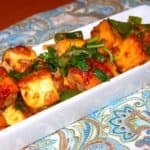 I was excited to try this recipe, as my vegan son is coming for a visit and I thought this would be a wonderful homey meal to serve. I went to my local co-op thinking it wouldn’t be hard to find the right ingredients there. LOL! I was wrong! No moong dal… hmmm I bought regular old green lentils. No curry leaves…. hmmmm I looked up some substitutions online and figured I’d use bay leaf instead. They did have brown rice but I thought some nice basmati would be good. I don’t have eggplant but do have a few zucchini in the fridge that need to be used. Everything else I have. Sooo… it seems I’m not really making the original recipe at all! Do you think my substitutions will work? Since I’m using white rice should I lessen the amount of water or shorten the cooking time or maybe add the lentils later? Any advice would be much appreciated! 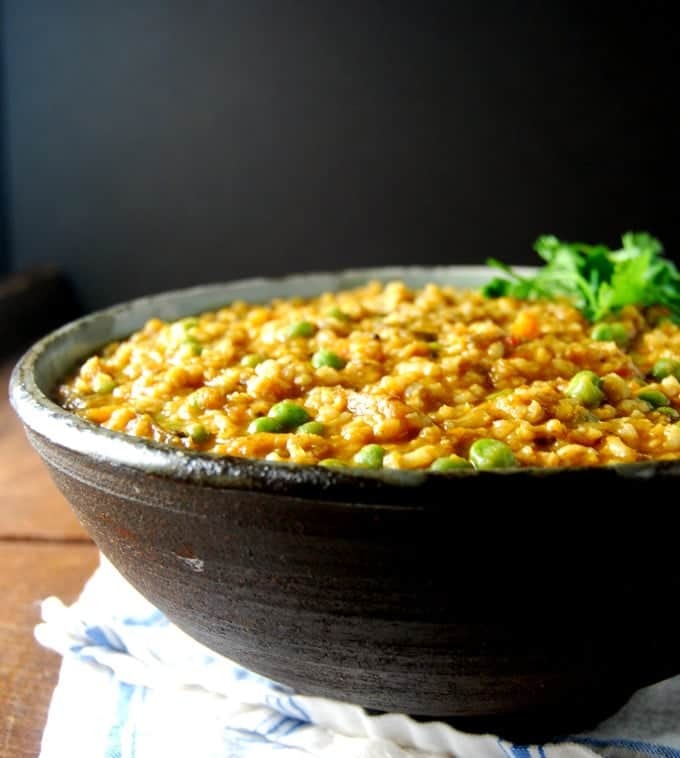 Hi Jenny, white rice is fine– use only four cups of water instead of six, and if the khichdi is too dry once cooked, just add some more water to give it a risotto-like consistency and reheat. Cook the rice and lentils together, just like I did with the brown rice. The other substitutions are fine. It’s the spices that give this khichdi its flavor, and so long as you use the rest of the spices you should be good. Green lentils would work perfectly well, and bay leaves are commonly used in Indian cooking so although they are not the same as curry leaves, they will work well here. We had it for dinner last night and it turned out great! Everyone gobbled it up, including my carnivorous husband. My 3-year-old twins each ate two big bowls. 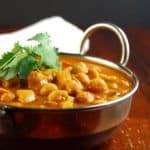 I’m looking forward to finding some moong beans and trying this again some time! I’m always on the lookout for a good khichdi recipe. My 7 yo will not pick out the veggies and my 10 month old likes it too. I can wrap up dinner with just one meal for everyone. Yours turned out great and my 7yo has asked me to feature this in the lunch menu for next week 🙂 I can’t tell you enough how much I love your recipes. 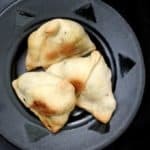 I have tried many of them (the others were given a pass only because I can’t get some of the ingredients in Bangalore!) and they all are easy, delicious and feed my soul. Thanks for sharing, Vaishali. Hi Noodle, thanks for that lovely message and for your encouraging words. 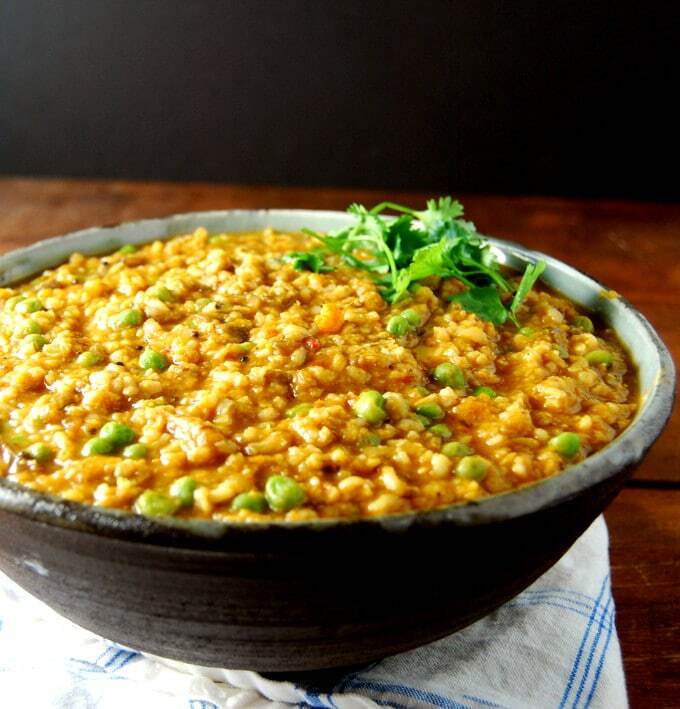 So thrilled you tried the khichdi– and thrilled even more that your 7-yr-old liked it. 🙂 If you ever have questions about substituting for any ingredients you can’t find in Bangalore, feel free to ask. This Masala Khichdi was out of the world. The spices all work great together and everyone in the family was asking for seconds. Thank you!! Suchitra, so happy you liked it. Thanks for letting me know! Just made this for dinner tonight here in New Zealand, and it was outstanding, with a resounding thumbs up from us all here! For some reason I can’t seem to rate it…I give it a 5! I had an Irish friend who made a “kedge” with potatoes–have you ever heard of that? Candace, I can’t say I have although potatoes would be fab in a kedgeree. Well, well. This one time I did quite well. i made some changes. As I didn’t have an onion, I used a leek, and I didn’t have Coriander seeds and I used some tulasi leaves. I know, a whole different thing. Then, instead of rice, I used some farro, and instead of peas, chikpeas. It did well, although I surely miss the fresh flavour of the coriander. I don’t want to eat with salt, so I didn’t add any, which resulted in my wife’s repproval. We have an issue with this subject. Anyways, I did have some fresh mint and I was happy with the result. You could feel the flavour of the eggplants and I would have added some zucchinis, but my wife caught me in fraganti and I had to leave it alone (she said last night they were bitter). Your recipes are great. I’ll follow, though I must admit I’m quite good at destroying your preparations. One day I’ll be rich and I’ll have all the ingredients at the same time. Haha! You created a completely different dish there and glad it tasted good! It definitely sounds intriguing 🙂 I must admit that I have never used tulsi for cooking – it’s purpose in India is chiefly for prayers and medicine. And here’s hoping you get rich soon! Hi Vaishali! 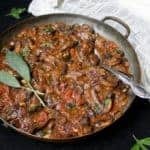 I just found your website today when I was googling for a kichadi recipe with zucchini and eggplant. 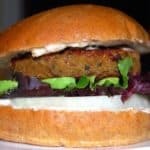 I will try other vegan recipes here for sure. I tried making kichdi with veggies, with some variation as I didn’t have some ingredients, turned our great! I only cook for myself and I don’t want to reheat leftover so I only cook small amount. Do you have any tips or suggestion for smaller portion cooking? Thanks! Hi Silvia, most of these recipes will work just fine if you reduce ingredients proportionately. Glad you liked the khichdi. 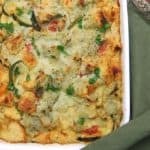 This recipe looks delicious and I can’t wait to try it tomorrow! I was wondering at what heat level should I be cooking everything? Do I heat the oil at medium or medium high? And once the pressure comes, do I keep it at the same temperature for the full 20 minutes? Thanks! HiShar, medium is best for this. And once it comes to pressure, cook on medium or whatever level you get a steady but gentle stream of steam at. grt snaps. have tried it. it tastes awesome. Nisha, thanks, glad you tried it! 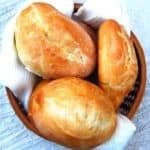 This recipe looks absolutely delicous!! I’m going to make this for lunch tomorrow!! Tried this khichdi for dinner today. But today he loved this khichdi. Hey, I bet you could make this in a rice cooker, yes?? Amazing meal. The levels of flavors are phenomenal. I’ve never seen curry leaves so I added just a pinch of curry powder to spice mix. The mint was a perfect addition. I’ll be adding this to my recipe rotation. Thanks again. Can you use regular eggplant instead of Japanese? I see all the comments but where is the recipe for Masala Khichdi? 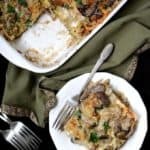 I love this recipe because the complex flavors and variety of ingredients make it incredibly satisfying and delicious. 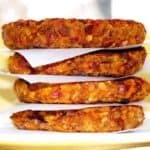 I have been searching for vegetarian recipes that make use of unusual (to me) combinations of vegetables, grains and spices and avoid the overuse of cheese. This recipe knocks it out of the park.